Sister Susan from Stockholm left a comment not long ago, asking me to share my chicken curry recipe. I often think if you can get the masala or base for this right, it will give you a good foundation to make other curries. 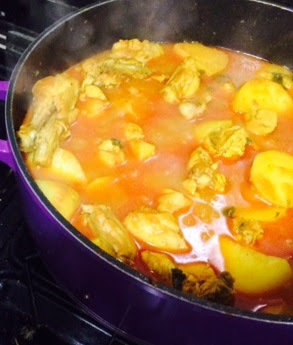 In the beginning when I use to cook, my chicken curry never quite hit the spot, it seemed a bit too pale and the sauce was too runny. I asked a few good cooks what they did and this is my version for where I am having improved it over the years. Heat some oil and sauté the diced onions until they are gold. The more you brown the onions, the better they will incorporate into the sauce, otherwise the sauce will feel as if its not fully cooked through. Add the ginger and garlic pastes and cook further until the onions are a deep gold. Add the turmeric, cumin, coriander powders and black pepper and the tomato paste and stir fry for about a minute further so that spices can release their taste and flavour. Add the salt and basar masala if you have it, I find it gives curries a really nice smell and taste. It includes some chilli, so I add it instead of chilli powder, but you can add either/both. Blend the tomatoes and green chilli’s together and add to the onions and spices. Cook the mixture until it is almost sticking to the bottom of the pan (but not quite). The oil should start to separate from the mixture and you should no longer be able to smell the tangy scent of the tomatoes. This is the bit I find makes the difference – the base of the curry is best when the tomatoes are cooked through completely. Once the tomatoes are cooked through and the oil starts to separate, add your chicken pieces and stir fry on high heat until the chicken is cooked through. Then add 1-2 cups of hot water and let the sauce cook for 10-15 minutes or so. Keep the hob on medium-high heat as if you lower it, the chicken will start to break. At this point you can add the fenugreek or coriander (not both). If you are using fenugreek then crush the dried leaves and drop them in just after you add the water and put the lid on and leave to boil. If you are using coriander then wait until the 10-15 minutes are up and sprinkle the chopped coriander onto the food, switch off the heat and leave the lid on for 5 minutes or so. Whichever herb you use will give the curry a lovely smell. Albeit both quite different. You can use either a whole chicken cut into pieces or chicken breast. The first will have more flavour but the latter will cook more quickly. You can add potatoes if you like, do so just before you add the water so that you can stir fry them with the chicken for a minute. Once you have added the water, let it boil until the potatoes are cooked through. If you want to use two chickens or more chicken breast, you don’t necessarily need to double up all of the ingredients. I usually just add a little extra salt and red chilli if I think its needed. I usually serve this with chapatti’s or my favourite way to eat it is with pilau rice. Even simpler, you could have it with bread, nan bread or boiled rice. Wow mashallah it looks so good. I guess time to change the meal plan for us today. Mashallah it was really good. The whole family loved it and definitely want it again. 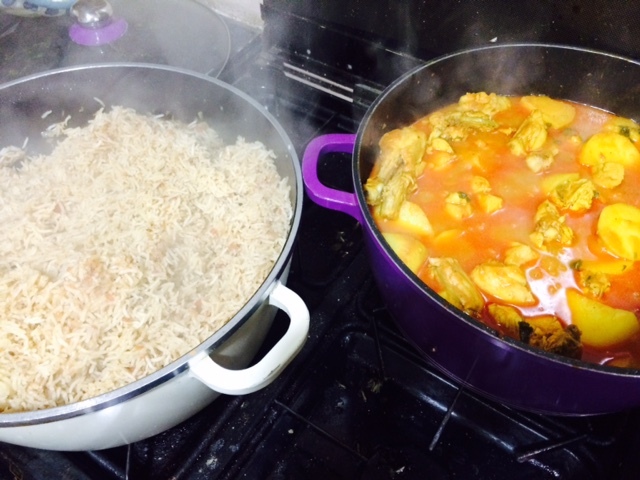 Jazak allahu kheyr for sharing the recipe. it looks delish MA! kinda hungry so i;d love to just eat the pic lol. mA! Props to you that you manage work, home, kids and spirituality MA! We do it abit differently.